Professional Quality! Hot Sticks Encaustic Wax Paint feature the same professional artist quality colors you find in the Hot Cakes line but come in a versatile artist-friendly stick. 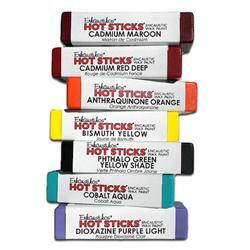 Hot Sticks are available in all 86 colors (72 of which are single pigment paints) plus Wax Medium and XD Wax Medium. These artist-quality colors are made from the most beautiful pigments, the finest Damar Resin, and United States Pharmaceutical Grade (USP) Beeswax. These paints contain no bleach or synthetic adulterants whatsoever. Our paints are milled on state-of-the-art equipment producing a paint that is rich, creamy, and vibrant. Made in the USA. The Perfect Shape! The Hot Stick design is very versatile - use Hot Sticks for encaustic painting, printmaking, rubbings, and even mixed media techniques. Hot Sticks can be melted directly on your hot palette to create a puddle of color for your brush or can be applied directly on a heated substrate. When applied to a heated substrate, Hot Sticks glide just like lipstick on your piece creating those vibrant colors or subtle earth tones you love. The Hot Stick will fit comfortable in your hand, apply just the tip of the Hot Stick to your heated substrate to paint more finer details of your painting or swipe the Hot Stick on it's side to make bold strokes of color. The Perfect Size! You can color mix using your Hot Stick colors directly on your painting, your hot palette or melt them together in a large tin to create custom mixes. You will have immediate color at your fingertips. Melt as little or as much encaustic paint as you want!